A group of children frolic on a river bank until one of them notices a body slowly drifting its way downstream. Those are the opening images of the film Poetry (also known as Shi), South Korean director Lee Chang-dong's very strong feature which won the best screenplay prize at the 2010 Cannes Film Festival. Poetry was released theatrically in the U.S. earlier this year and arrives on DVD and Blu-ray today with exclusive online streaming rights for the film beginning on Fandor today as well. Lee belongs to a large wave of exceptional South Koreans filmmakers who have been capturing the world's attention in the last decade or so. Lee's 2002 film Oasis won him the best director prize at the Venice Film Festival. Of course, his peers include Bong Joon-ho (Memories of Murder, The Host, Mother), Kim Ki-Duk (3-Iron, Spring, Summer, Fall, Winter...and Spring) and Park Chan-Wook (Oldboy) to name but three others. In some respects, writer-director Lee's Poetry shares some story strands with Bong's masterful Mother from last year, but the resemblances remain mostly superficial and, while Poetry is good, it doesn't come close to approaching Bong's masterpiece. Poetry made news in its country of origin by marking the first screen appearance in 16 years of veteran South Korean actress Yun Jung-hee as Mija, a 67-year-old woman raising her sullen and obnoxious teenage grandson Wook (Lee David) alone after her daughter dumped him on her when she moved to Pusan following her divorce from his dad. We don't learn all this about Mija immediately. The viewer first encounters her as she visits a health clinic complaining about a tingling in her right arm, but she can't remember the word to use to describe it. She laughs to the doctor that she's been forgetting a lot of common words lately such as bleach. The tingling doesn't worry the doctor, but the forgetfulness does and he suggests she go to a big hospital in Seoul for a more thorough examination. Mija keeps the doctor's concern to herself, only telling her daughter on the phone that he recommended more exercise to help with the tingling. She then reports to her part-time job as maid and caregiver for an elderly man named Mr. Kang (Kim Hi-ra) who suffers from the effects of a major stroke. Once Mija finally gets home, she hears on the TV the report about that body we saw at the beginning. It turns out to have been a girl who attended the same school as Wook and committed suicide. She asks Wook if he knew her, but he's aloof as usual, saying he doesn't know everyone in his class. His grandmother does manage to get Wook to hit a badminton birdie back and forth in the street in front of their apartment though Wook seems completely disinterested, so much so that when a group of his friends come by he just takes off without much of a word. YOU TOO CAN BE A POET! 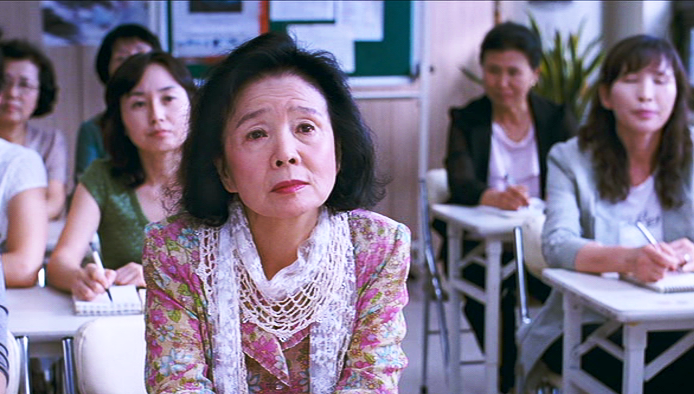 Though she's too late to sign up, the teacher (Kim Yong-taek) lets her sit in the less-than-filled-to-capacity class anyway. Mija enters as the teacher displays an apple to the class, telling them that while they may think they've seen apples many, many times in their lives, they will find in his twice-a-week, monthlong course that they've never truly looked at an apple. He also tells the students they will only have one assignment in his class: write one poem of their own by its end. So he advises them to keep their pencils sharp and their notebooks handy. Mija interrupts him to proudly promote her pencil-sharpening abilities, giving the class a good laugh. She does take the teacher's words to heart though, taking a notebook with her everywhere because, as he said, poetic inspiration can come at any time. Soon, poetry becomes the only thing in Mija's life in which she finds any joy. She quits her job with Mr. Kang when the old man tries to get her to service him sexually while she bathes him. Wook grows more distant, usually out with his friends or hidden in his bedroom with them at late hours. As Mija goes to the poetry class one day, she gets a phone call from a father of Wook's friend Ki-bum who says he needs to meet with her. She tells him that she's heading to class and he agrees to pick her up when it's over. The poetry teacher enthralls Mija again with his philosophy of poetry, telling the class that poetry exists all around them — they just have to open themselves up so they can see it. "It's about discovering true beauty in everything we see in our everyday life," he explains to his class. "Every single one of you carries poetry in your heart, but you've imprisoned it. It's time to free your poem. The poetry imprisoned in you must be given wing to take flight." Mija raises her hand and asks him where they should look because she's having trouble finding the inspiration. He tells her she could find it anywhere, even in the dishwashing basin. When Ki-bum’s father (Ahn Nae-sang) arrives, he takes Mija to a restaurant where the fathers of four of Wook's other friends sit and wait. After brief introductions, the father (Min Bok-gi) of another of Wook's friends, Soon-chang, explains to Mija what's going on. It seems that Heejin, the girl who killed herself, did so because she had been being raped for months by their sons and Wook. Keejin wrote it in her diary and her mother took it to the school and the police. Apparently, Soon-chang's father says, it began with Soon-chang and Jong-chul, who claim it was consensual, then the other four joined in. Mija appears to be a blank as the story is told then, without saying a word, she leaves the restaurant and goes to the flowers in front of it and starts taking notes. The men find it rather odd, but think nothing more than that and continue their discussion. The school wants to keep it out of the news and the police want to avoid being forced into an investigation (are South Korean police ever not corrupt in any of the great new films coming out of that county? )so the fathers have agreed to try to calm Keejin's mother down with a cash settlement of 30 million Won (nearly $28,000), meaning each of the fathers and Mija would have to come up with 5 million Won (roughly $4,600 each). Ki-bum’s father tells the other that Wook's grandmother lives on social security and as a part-time maid and had to raise him when his mom left after the divorce. He finally goes outside to see what Mija had to write in her notebook and she says the flowers reminded her of blood. As if the situation weren't complicated enough for Mija, who has no means to come up with her part of the settlement, she finally goes to Seoul and takes the tests and gets confirmation that she is indeed in the early stages of Alzheimer's, prompting her to write in her poetry notebook, "Time passes, flower fades." It's the main reason I used the quote from the poetry teacher as the headline since it should be apparent to most around Mija that something is amiss with Mija, but everyone is too wrapped up with themselves to have spotted the signs of the disease earlier. Poetry isn't really a film that depends on plot twists, yet it's best not to go much further into how the film unfolds because that's part of its pleasure, despite the fact that at 2 hours and 19 minutes, it could have used more judicious editing. There isn't any reason to stretch it out that long even though so much of it is good. Kudos should also be given to the wonderful cinematography by Kim Hyun Seok. Without question, what truly provides the meter for Poetry is Yun Jung-hee as Mija. The actress, while virtually unknown in the West, was recently voted by the Korean public as the greatest Korean actress and she certainly impresses here. Yun appears in practically every scene and has lots of standouts. She doesn't overplay her growing dementia. When she tries to confront Wook about what he did and he goes off to hide in his bedroom, burying himself under his blanket, and she keeps asking, "Why did you do it?" while he pulls the blanket tighter and tighter over his head and she tugs with all her might trying to whisk the covering off him. In a series of scenes interspersed throughout the film, the students share the most beautiful moments of their lives. Most involve some degree of pain, but her classmates seem to tell the stories happily, especially in the case of one man who keeps smiling and laughing as he admits he never had a beautiful moment. When it's Mija's turn, her childhood tale is a happy one for the most part but in contrast, she breaks down in tears. As with many poems themselves, much of what happens in Poetry, especially its ambiguous ending, is open to interpretation. Yun gets to show a completely different side when she visits Ki-bum's father's karaoke bar to ask for a loan and while she waits, breaks into song whose English lyrics including the telling translation "drink a glass of oblivion." Mija also stumbled upon a restaurant that hosts a weekly open mic night for poets where she takes offense at a particularly drunk man (Kim Jong-gu) she feels disrespects poetry with his dirty jokes. She's shocked further when she encounters her poetry teacher one night and he tells her that poetry is dying. "The day will come when no one will read or write poetry," he predicts. These are times when poetry is dying away. Regardless, people continue to read and write poetry. This is a question I want to pose to the public. What does it mean to be making films at times when films are dying away? As long as there are filmmakers such as Lee making movies as good as Poetry, even if it could use some cutting, he may be premature in writing cinema's obituary. Great review. I've only seen one film by Lee Chang-Dong (Peppermint Candy, which was great) but after reading this I definitely want to see more from him. Thanks! I saw this film when it was playing at the Quad Cinema earlier this year at the recommendation of my photo critique professor. Even though some of the film could've been easily cut, it definitely hit home to see such personal devastation and loss of oneself in a ponderously paced fashion. That Mija also attempts to observe her surroundings through a critical lens as a way to stave off her dementia is a predicament that most artists (particularly young ones, including me) should acknowledge and respect. Such resonance makes most of the (for lack of a better word) "popular" films i've seen this year look like cheap stick drawings. As an aside, i'm jealous of the gorgeous natural light they have over in South Korea. I wish some of it would magically appear over here, but i won't hold my breath.